The Blaine County Historical Museum will welcome Carey native Mary Peterson to the Heritage Court this summer, celebrating her many years of public service and participation in the agricultural heritage of Blaine County. "I was flabbergasted and surprised by the honor," said Peterson, whose family cleared land, farmed and ranched in Muldoon Canyon near Carey before the era of mechanized agriculture. "She is known worldwide for her rolls and sweet rolls—everyone wants her to bring them for picnics," said her daughter-in-law Deb Peterson. Mary was born Jan. 7, 1931, in Carey to Myrl Patterson Carlson and Leonard Carlson. She is one of six children. She learned to drive when she was 14 in a Model A Ford, and drove a team of horses to load and stack hay, using a slip and derrick. "During World War II, farmers had trouble getting help to put up their hay, so we kids were recruited," she wrote in a letter to the Blaine County Historical Museum. Peterson has kept a daily journal since 1952, detailing her life in Muldoon and in Carey. After the war, Peterson drove a tractor for her next-door neighbor Jim Peterson, a farmer's son with deep roots in the region. They soon fell in love. "The family joke is that Jim couldn't afford to pay me, so he had to marry me," Peterson said. In 1950 the Petersons bought their first farm, and spent the next few years picking rocks and burning sage from 80 acres. They had three kids: Jim Jr., Karl and Carol, and eventually added cattle and sheep to their operation. Electricity came to Muldoon in 1962. Mary drove a school bus for 20 years and served as president of the Idaho State Wool Growers Association for three years, promoting sheep, lamb and wool products around the country and the world. She also served as president of the American Legion Auxiliary for 10 years and as a visiting teacher for the Mormon Church. 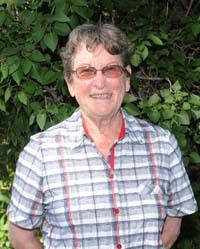 Mary helped bring the Boys Scouts to Carey, serving as a den mother for three years. She gathered signatures in support of the Blaine County Recreation District and was active for many years in the PTA. For 50 years, she has been a member of the philanthropic Progressive Club of Carey, and for 35 years has raised the flags on Main Street for Veterans Day. At 81, Mary Peterson is spry and sharp, something she attributes to an active lifestyle. "I stay busy. There's always something to do," she said. The Petersons celebrated 60 years of marriage in 2010 at the Muldoon Ranch home that they built in 1952. They wintered for 25 years near the alfalfa fields of Blythe, Calif., on the Colorado River, during lambing season. In 2000, the Petersons sold the last of their flock to the Lava Lake Land and Livestock Co. In 2001, they were honored by the Idaho Wool Growers for many years of support, dedication and commitment. Despite living all their lives in Carey and Muldoon, the Petersons also found time to travel, including a train trip through Canada and a family trip to Jamaica. "We also went on an unforgettable trip to Australia and New Zealand where we were able to see up close how sheep operations are managed Down Under," she wrote. From their deck in Muldoon, the Petersons can see deer grazing in the front yard each morning. During the summer, they are joined by as many of their six grandsons and eight grandchildren as they can gather. "We enjoy them tremendously," she said.